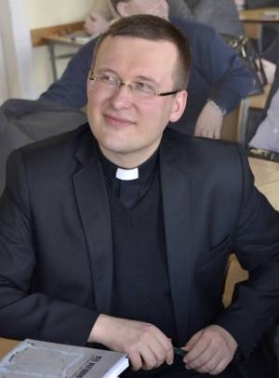 Marcin Tkaczyk (born 19.05.1976) has graduated in philosophy and in theology. He obtained Ph. D. in logic. His research area is non-classical logics, history of formal logic and applicability of logic in physics, philosophy and theology. He released 32 papers on meaning in theological language, formalization of theistic arguments of Anselm and Duns Scotus, physical necessity, natural deduction in classical and modal logic, temporal logic, methods of proof in Aristotle's and Ockham's logic, conditionals in ancient and medieval logics, time-variable in ancient and medieval logic, Ockham's interpretation of the third truth-value, scientific realism and modal realism. In his papers he defends theses on meaning equivalence in theological and natural discourse; essential presence of modal terms, which are not analyzable in normal modal logic, in languages of physical science; formal differences between temporal concepts of physical science and tense-logical concepts; a posteriori character of Anselm's theistic argument; inner essential relationship between the use of time-variable, diodorean conditional and the theories of consequentiae of Abelard and Pseudo-Scotus, and some other theses.